Michael Caine and Co will no doubt forgive us the comment that The Italian Job was a curious name for a film depicting British Minis and British characters, even if all the action did take place in Italy. Actually, the title was succinctly apt and we can do no better than to borrow and adapt it for this tale of a real triumphant Italian job. The Italians have always been highly championship-conscious. Pots and prizes were never to be sneezed at, but they have always set much greater store by laurels, garlands, crowns and titles —especially titles! Emerging champion after a whole series of competitions attracts the ultimate accolade, which is far more exciting and glamorous than winning any of them separately. No little bits of spaghetti for the Italians: they go for the whole string! When Swedes and Finns began to occupy regularly the winners' rostrums of the world's major rallies, Lancia and then Fiat joined other teams in snapping up the best of them. Munari apart, leading Italian drivers of the time, good as they were, did not quite have the polished natural ability of the northerners and, although patriotism would have preferred Italian driving seats to be occupied by Italians, what was the point of having a winning car without a winning driver? True, there have been wins by several Italian drivers, but it is largely to people such as Andersson, Lindberg, Kallstrom, Lampinen, Waldegard, Salonen and Alen, not forgetting non-Scandinavians Darniche, Andruet and Rohrl, that Fiat and Lancia owe their championship successes. Invariably the celebrations have been jubilant and boisterous, but one thing has always been missing: an Italian driver as World Champion. Munari did win the FTA World Rally Trophy once, but in those days rallying was not sufficiently respectable in the eyes of the FIA to deserve the actual title of World Champion. 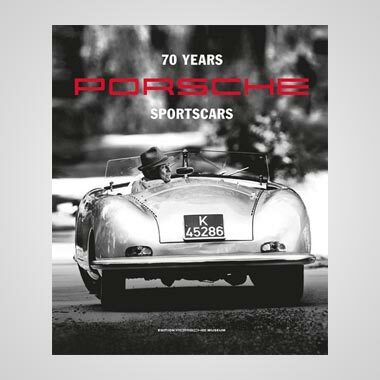 Nothing would approach the total satisfaction of a positive Grand Slam — victory by an Italian driver in an Italian car in World, European and Italian championships. Finally, after years of trying, they achieved just that in 1989. At Sanremo in October, Massimo (Miki) Biasion scored his fifth outright win of the year and became the first Italian to be pronounced World Rally Champion since the title was created in 1979. 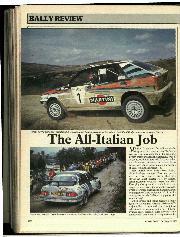 What is more, Lancia won the makes' title and Dario Cerrato clinched the Italian Championship, also in a Lancia. From Sanremo to Turin, the rafters reverberated that night. Since Lancia took over Peugeot's remarkable winning streak and continued with a Group A Delta after Group B cars were banned, the absence of any challenging opposition has given the Italian team field-day after field-day. It has romped home the victor almost wherever it has been, and so often has it filled more than one of the leading places that it has become accustomed to choosing its own winners by managerial manipulation. Deciding which of its drivers should win is nothing new for Lancia; it happened in Stratos days, but never as blatantly as in the past few years, when team orders have become something of a joke. On the other hand, we can appreciate Lancia's situation, for there have been cases of one dominant car winning the makes' championship but (because victories have been spread between several drivers) the title in the drivers' series going to someone in another make of car who has scored a higher aggregate by consistent seconds and thirds. Ensuring that one driver picks up all the big points scores is a straight path to both world titles. One especially artful move this year, at the time not recognised for its significance by most observers, was the withdrawal of Markku Alen from the Safari. Three cars had been entered, for Biasion, Preston and Alen, but the Finn was taken out because, it was said, the team would be better able to look after two cars than three. Whether this was sincere will remain a matter for conjecture, but it so happens that one of the rules of the World Championship states that no driver can become World Champion if he has not competed outside Europe. . . 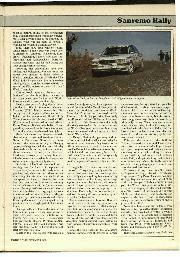 It also happens that Alen's only non-European rally of 1988 was to have been the Safari, so his absence from that rally effectively removed all his chances of becoming World Champion, no matter how many points he amassed within Europe. A coincidence? We wonder! In Kenya, Biasion also got away with an indiscretion which should have resulted in his exclusion, and he owes a big favour to the official who chose to overlook his omission provided he took immediate steps to rectify it, which he did. At a rest-stop, he and his co-driver left for their hotel after inexplicably refusing to hand in their time card, and even novice competitors know that this is a cardinal sin. It might be naive of us, in these devious times of hard bargaining, prodigious advertising and mammoth fees, to consider professional rallying as anything but a tool of big business, but we still feel that, despite huge support-operations by factories, the foundation of the sport prevails today --two people and a car out on their own, attempting to beat all others. Essentially, it is not a team sport, and to deliberately shrink from a clean fight is to border the fraudulent. We certainly do not wish to steal Biasion's thunder, nor even to mute it, for he is a very capable driver, and a relaxed, affable chap at that. But even he must admit that not all his wins have been on merit. Undoubtedly he was Lancia's choice as number one candidate for the world title, and who can blame him for accepting tactical support from within his team to augment his own considerable driving talent? Since the fine roads in the mountains behind Sanremo were all covered in tarmac some years ago, the organisers have gone far afield to seek dirt roads for their special stages. Regular visits have been made to Tuscany, sometimes even to San Marino, where the stages have been excellent, but the consequent long motorway distances have been cripplingly boring. 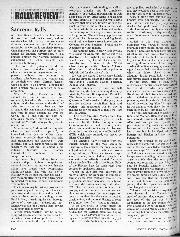 There was also a time when the event, then held in February, was combined with the Sestriere Rally, but the format of a start at Sanremo and a finish in the snow of that ski-resort was not popular and was soon abandoned. This year the route extended both to Tuscany and to the area around Turin in the north, so that it resembled a huge triangle with special stages clustered at its angles and motorway runs stretched along its sides. Stages made up 343 miles, road sections nearly 1300, and again the long road sections were unwelcome, whilst the traffic jams in and around the highly-populated city of Turin caused untold frustration. To satisfy FISA, there was the usual mickey-mouse stage, absurdly christened "super-special" by Paris. 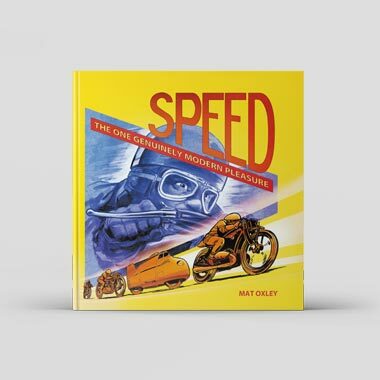 This one, winding through flags and cones on the infield of an oval track, was particularly inappropriate as part of a World Championship rally. However, the real stages provided good competition. 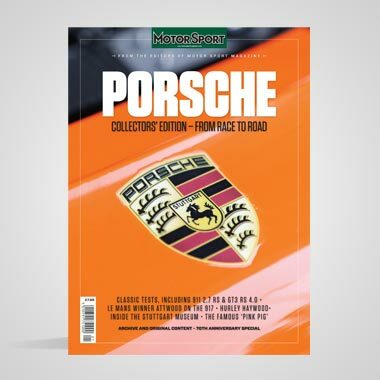 The mixture of tarmac and dirt (about 50:50) provided variety, and headaches for engineers who had to plan for suspension changes as cars moved from groups of one to groups of the other. Naturally, Lancia was out in force, with five cars — two backed by Martini for Biasion and Alen, and three backed by the Jolly Club and Totip for Fiorio, Cerrato and Frenchman Yves Loubet. In opposition were three Ford Sierra Cosworths for Auriol, Blomqvist and Sainz, two 4WD Toyota Celicas for Kankkunen and Eriksson, and a BMW M3 for Zanussi. In the initial stages it seemed very likely that Kankkunen would repeat his Thousand Lakes performance and give Lancia run for its money, but on the first stage of the second leg, after the first night-stop in Turin, he went off the road on a wet, downhill, left-hand bend, and over a steep edge. Fortunately, trees held the Toyota back, and neither Kankkunen nor Piironen was injured, but the car was wrecked and they could not continue. Alas, when a Citroen went off later at the very same bend it was not restrained by the trees, and dropped into a ravine. Tragically, its French crew, Jean Marc Dubois and Robert Moynies, were killed. There were also several accidents involving spectators during the rally, for although there were flimsy plastic barriers at various places they were by no means enough to prevent watchers standing in highly dangerous places. Fortunately, no spectators were killed, but there were some pretty serious injuries. Another to drive impressively at the start was Sainz, using both the power and the handling of his Sierra to good effect on the tarmac roads. At the end of the first leg he was third, behind Cerrato and Kankkunen, whilst Biasion, Fiorio, Auriol and Alen followed in that order. 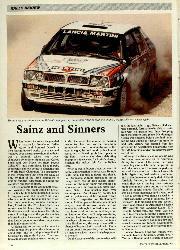 Auriol eventually retired when his Sierra slid off a wet road, emulating Loubet who did the same thing in his Delta. 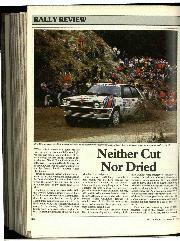 Zanussi stopped when his BMW M3' s gearbox let him down. 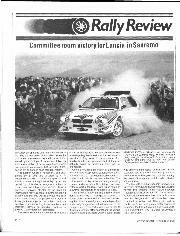 As the rally progressed southwards to Tuscany, then westwards back to Sanremo, where the final leg of five stages was held on the tarmac roads of the nearby mountains, a quartet of Lancias emerged at the head of the field. After earlier troubles, Alen moved up to second place, only about a minute behind Biasion and followed by Fiorio and Cerrato. 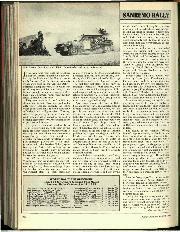 Fiorio was very lucky indeed to stay among the leaders, for his clutch began to pack up, but not the electrical operating mechanism with which the Lancias were fitted for the first time. He either had to stop to have it changed, bringing certain road penalties, or risk total failure in the next stage which was not far away. By sheer coincidence, that next stage was cancelled due to the absence of an ambulance (there had to be one at the start and one at the finish) and Fiorio was able to have his clutch fixed without losing road time. Strange that several other stages went ahead without the required ambulances! 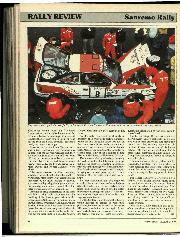 For the final leg it was thought that Lancia would instruct its drivers to keep their positions, but after the third of the five stages Alen was down in fourth place again. It was said that he had chosen the wrong tyres, but on dry tarmac this did not seem reasonable. Later, the explanation of rear brake trouble was offered. On the next stage, Cerrato lost a minute, allowing Alen to move back up to third place, and even if team orders had not previously been issued, they certainly were after this incident. Cerrato was certain of his Italian national title whether he took third or fourth place, but his team wanted him to gain a FlSA Group One seeding, and for this he needed at least third place. The result was a deliberately slow time by Alen on the final stage, which put him back to fourth place and gave Cerrato the seeding both he and his team wanted, ensuring a start-number among the leading group in future rallies. For Lancia team boss Cesare Fiorio it was the ideal result. Biasion had won , Fiorio's own son had finished second, Cerrato got his third place and the Italian Championship, and Alen made up the quartet of Lancia, ahead of Sainz whose Sierra was the best placed two-wheeldrive car. What is more, Fabrizio Tabaton had already settled the European Championship in Cyprus, so it was an all-round Italian triumph.